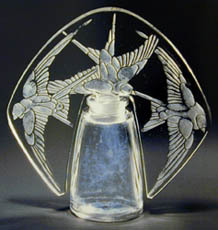 Rene Lalique is perhaps best known for his impressive range of scent bottles both for the famous French perfume Houses and for the bottles he sold directly to be filled with the consumers favorite scents. The story is well known of how Lalique met his neighbor in Place Vendome Francois Coty around 1907 and first designed labels and then flacons for the famous parfumeur. This was the beginning of Lalique producing glass in industrial mass production. Over the next 3 decades Lalique produced 100s of models in considerable quantity and the scarcity of these wonderful works of art today, is due to the fact once emptied of the contents most were disposed of.